I love the idea of jam. Last year I made half pint after half pint not because I loved jam, but because I loved the idea of jam. I told myself that although jam had never played much of a role in my adult life (I don’t know that I’ve ever purchased it in the grocery store), that surely I would eat jam if it was in the pantry, and homemade. But, by Christmas I had given most of it away as gifts. Last year I loved the idea of jam so much that I froze peaches that didn’t immediately make it into jam so that I could be free to make jam any time I pleased throughout the year. Now, nearly one year later, several quarts of peaches stare at me from the back of the freezer. Determined to be rid of these before the next round of peaches arrive, and against my better judgement, I decided to turn some of them into jam last week. 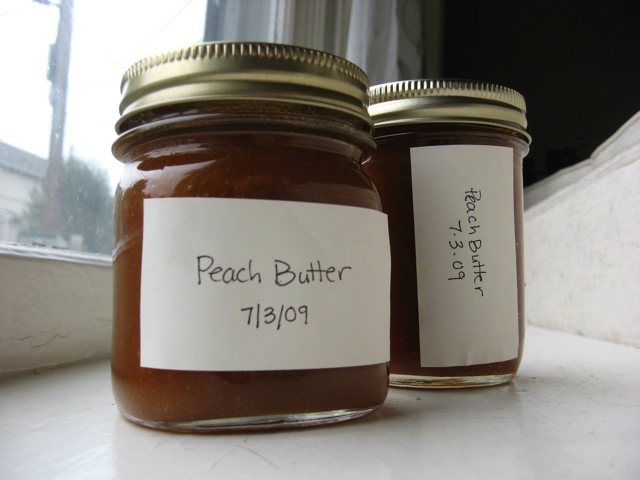 When the jam failed to set and I was left with a few pints of peach sauce, I decided to try my hand at peach butter. As it turns out, I love peach butter. Not just the idea of it, but the actual food. I like the deeper flavor it takes on after cooking for so long. I like the way it coats a piece of toast. So I begin this season of putting food by with clarity. I will not try to make myself love something I don’t just because I can make it myself and think it romantic. I will not use the freezer as a tool for prolonging the life of something that I plan to preserve in some other fashion at a much later date. I’ll make the things I love. Because homemade might make it better, but it might not be good enough to make me want to eat it.